Thanksgiving Day is a wonderful time to join together as a family in thanks for all that God has done. 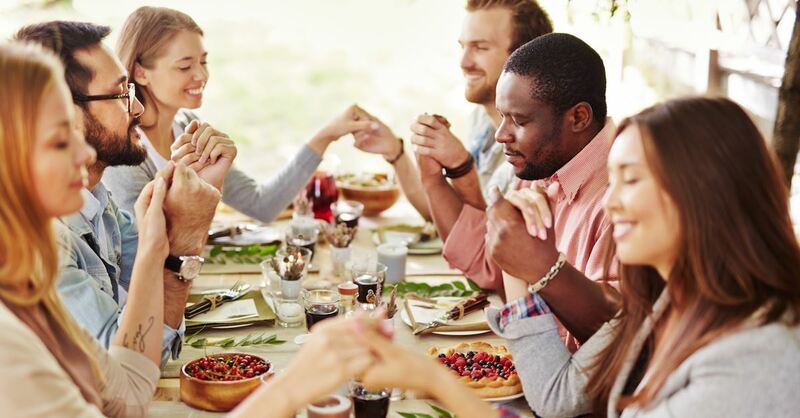 Use this prayer as you gather around the Thanksgiving dinner table - whether your family has a traditional blessings that's said before the meal or you have family who is far from God, this prayer can guide all toward a heart of gratitude. I give you thanks with all my heart because of your constant love and faithfulness. Praise you. God, you established the example of a loving Father, the layout of a faith-filled family. You created man and gave instructions to multiply. Because of you, people find family and aren’t alone. Your plans and work are wonderful. Thank you for caring and for your creation, God. Thank you for faithfully loving people. I give you thanks for family—those relatives by blood, adoption, and friends that find me when I am alone. You’ve gifted and given talents to each member circling me. You know the plans you have for them and me, and they are good. You thought of us before time began, making preparation for our final communion. And it is good. Praise you, Lord. Thank you for faithfully loving my family. I give you thanks for fathers and mothers. Bless mine and those around the world today. For any who are struggling, may they be strong in you and in your mighty power. May they trust in you and lean not on their own understanding, acknowledging you in all their ways. Thank you that you promise to make straight paths. And for the mothers and fathers who don’t know your salvation, Lord, I pray they hear your voice and accept your saving grace through Jesus today or sometime soon. Thank you for creating fathers and mothers, for faithfully loving them. Thank you for creating and gifting mine. I give you thanks for brothers and sisters, for threading them together in the manner you have, Lord. May they live long in the land, being fruitful in your spirit. May love, joy, peace, patience, kindness, goodness, gentleness, faithfulness, and self-control burst from their life. If they are not born again, I pray now for their salvation. May they know the assurance of heaven through Christ. May they give their life to you. Thank you for placing brothers and sisters—biological, spiritual, and friends who are like family—in my life. Thank you for faithfully loving them the way you do. Thank you for grandparents, for faithfully loving them in a way only you can. I give you thanks for the grandparents in our lives. Thank you for the godly legacy they plow, the beautiful memories they sew, and any prayers they planted in the past or now. Father, whether middle-aged or older, may they be led by you, and especially in the later years of life. May they know well that you, God, so loved the world that you gave your one and only son for them. I give you thanks for extended family members. Lord, you have created aunts and uncles. In them, I find connection. Bless the work of their hands, Lord. Thank you for the blessings they’ve already been given. May they know that in you all things hold together and that at the name of Jesus all will bow. If they aren’t born again, I pray today for their salvation. Lord, I thank you for faithfully loving aunts and uncles as you do and for intertwining their lives and mine. I give you thanks for love. Jesus, you have loved us by giving your life to cover our sins. Thank you for pulling my family close with such deep assurance, for sacrificing for our good. May each member grab hold of your grace and keep on loving one another daily. Thank you, Father, for love. I give you thanks for our home, the place our family gathers. Thank you for the warmth it offers and safety, too. I am thankful for a place to remain dry on rainy days, congregate and share stories in the evening, and offer encouragement, praise, and prayers throughout the week. May this home and others in the future be walls with worship, homes for hospitality, places with purpose. Thank you, Lord, for our home. I give you thanks for the church in which my family worships. We gather and go, freely and easily. It’s a place where each member worships, praises, and grows in faith. Thank you for the leaders within, the ones who champion the name of Christ and encourage eternity with him. Thank you for those you use to encourage my family’s spiritual maturity. Thank you for pastors, prophets, evangelists, teachers, and apostles. Thank you for providing the gathering body of believers that my family is a part of, for the place in which my family worships. I give you thanks for provision for our family—from food and employment to healing and deliverance. You care more about my family members than the sparrows or the lilies of the field. Just as you provided quail and manna for the Israelites in my Bible, you provide for my family today. Father, thank you for being a God of provision. I give you thanks for your healing. I pray for willing hearts within my family, ones that sit solidly with healing. For hardened hearts, soften them, mine included. Lord, you offer forgiveness. May my family and I cling to and offer it freely as you have done for us. Thank you for healing. Thank you, God, for washing my family and me in forgiveness. I give you thanks for your promises. You have spoken them over every member in my family. You promise to never leave us or forsake us. You set in writing that we are heirs. God, you assure that a beautiful eternity awaits with Jesus. And I believe you—for myself and members of my family. Thank you, Lord, for your promises spoken over my family. And Father, I give you thanks for each family member. Your work in each one of us is good because you are good. Thank you for creating us and loving us with your eternal love. Thank you for working out the plans for each life you created in this family. Lord, complete the work you have begun in each heart. I know you won’t abandon us, for your faithful love endures forever. Today, I give you thanks, God. In Jesus’ name, Amen. 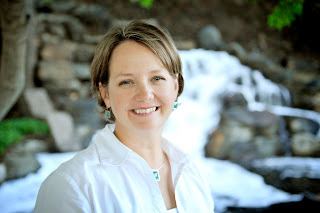 Kristi Woods, writer and speaker, is passionate about women walking deeper with God. She writes encouragement and offers faith-building tools at www.KristiWoods.net, around the Internet, and in various publications. Kristi, her husband, and their three children survived a nomadic, military lifestyle, and have set roots in Oklahoma—where she keeps an eye out for chocolate and tornadoes.